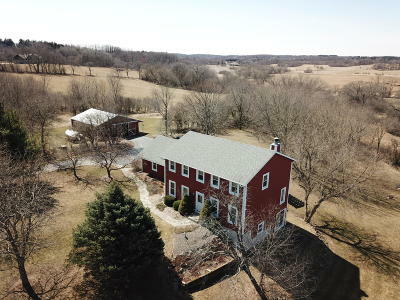 Country living at its finest on this hilltop property in the Town of Mukwonago. An incredible 6 acre partially wooded lot offering privacy & incredible views is the setting for this 4 bed-2.5 bath colonial. The 32x35ft outbuilding has 2 horse stalls & a tack room along w/ plenty of storage space. Rustic pine floors are found throughout much of the home. The cozy family room w/ natural fireplace is sure to be your favorite spot in the winter months. Spacious master suite with walk-in closet & gorgeous remodeled bathroom featuring a tiled walk-in shower. 3 additional bedrooms on the 2nd floor. Main floor laundry. Partially finished basement features a rec room with gas FP & walkout patio door along with a 5th bedroom/office. Two tiered deck faces west to capture sunsets! Original owners.